William Watson (1847-1921) flourished 1866-1920 and came from a family of painters originating in Liverpool. 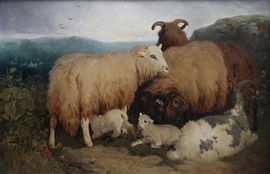 A pupil of iconic Sir Edwin Landseer and also French artist Rosa Bonheur, William's work was detailed yet also full of movement, with an excellent sense of the proportion and majesty of the animals he mainly portrayed. Exhibiting locally and also at the Royal Academy in 1972, his works can now be found in galleries and museums as far flung as Minneapolis in the USA.